You don’t have to look hard to find ceviche in Peru … it’s everywhere! While the dish can be found in many South American countries, many consider it Peru’s national dish. In fact, it’s so beloved that it even has its own holiday (June 28, if you’d like to celebrate)! 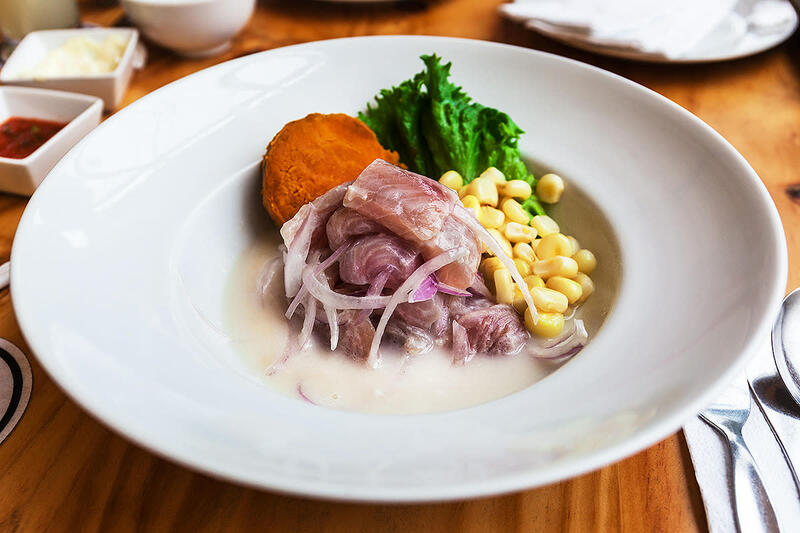 So when I visited Lima, I was on a mission to find the best ceviche in city. Admittedly, I was unable to sample every restaurant’s interpretation, but luckily, my guide from Journeyou, Ricardo, introduced me to the ceviche at El Señorío de Sulco. Made from fresh fish, herbs, and lime, this ceviche was so tasty that I quickly cleared my plate. I didn’t leave with a doggy bag (trust me, you don’t want old ceviche), but I did leave with the recipe. Make this ceviche to cool yourself down on a hot summer day, or to spice up your next dinner party with some South American flair. Cut the fish into cubes and place in bowl. Cut red onion into strips. Place in fresh water to chill. Add salt, lime juice, chilli, and cilantro to the bowl of fish. Add in red onions. Stir. Add a splash of milk to help lessen acidity of limes. Serve with sweet potato, corn, and lettuce.